Vinyl Me, Please, the "best damn record club out there," in association with Legacy Recordings, the catalog division of Sony Music Entertainment, announce that a special 20th Anniversary 2LP 12" vinyl edition of Fugees / The Score will be available exclusively to VMP members as the club's "Record of the Month" for April 2016. 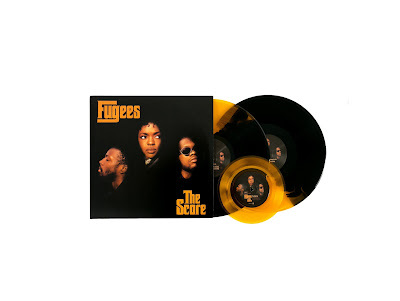 VMP's 20th Anniversary Edition of The Score includes the original album (pressed on 2LP split-color black and gold vinyl and housed in a gatefold sleeve) along with a bonus 7" gold vinyl single featuring three bonus tracks (previously unavailable on vinyl): "Fu-Gee-La" (Refugee Camp Remix), "Mista Mista" and "Fu-Gee-La" (Sly & Robbie Mix). VMP members will also receive a 12" x 24" Fugees fold-out poster with this highly collectible 20th Anniversary vinyl edition of The Score. Fans of the Fugees and aficionados of the vinyl record listening experience may sign up for Vinyl Me, Please membership at vinylmeplease.com/record-of-the-month/. About Fugees / The ScoreOriginally released on February 13, 1996 (on Ruffhouse/Columbia Records), The Score was the second (and final) studio album from Fugees, a revolutionary alternative hip-hop group comprised of rapper/singer/producer Lauryn Hill, rapper/singer/producer Wyclef Jean and rapper/producer Pras Michel. The follow-up to Blunted on Reality, the Fugees' moderately successful 1994 debut album, The Score--with its visionary mix of hip-hop, soul, reggae, audacious sampling and cinematic aural textures--became an indomitable force in pop music and culture, a landmark of hip-hop and a soundtrack for the decade. The Score peaked at #1 on both the Billboard 200 and the Top R&B/Hip Hop Albums charts, has achieved 6x RIAA platinum status and brought home a pair of Grammys including Best Rap Album and Best R&B Performance by a Duo or Group with Vocals (for "Killing Me Softly"). The Score's reputation has only grown over the years with many music critics and publications citing it as one of the greatest albums of the 1990s as well as one of the most influential and important hip-hop albums ever made. About Vinyl Me, PleaseVinyl Me, Please is a record of the month club that believes in the album as an art form. VMP's mission is to connect people with music on a deeper level. Each month members receive a vinyl record, newly or re-released, an original album-inspired art print, and a custom cocktail recipe, to encourage a complete and sensory album experience. Vinyl Me, Please believes the vinyl format re-introduces ritual and process to listening, to deepen a personal relationship with music. Founded in 2012, Vinyl Me, Please is based in Colorado, and has members in more than 40 countries.